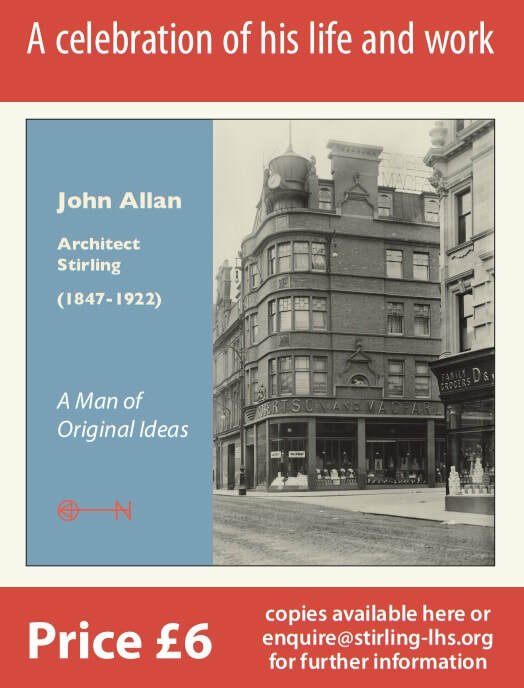 ​Stuart Campbell, Andy McEwan and Dorothy Wilson, all members of Stirling Local History Society were previously involved in producing a guided walk leaflet about 19th Century architect John Allan’s Stirling buildings. This leaflet was produced in conjunction with an exhibition held in the Smith Museum last Autumn to celebrate this local architect’s life and work. In the process of carrying out our research, they gradually discovered a great deal more information about John Allan’s life, work and interests, than was required for the purposes of the leaflet. (They are still discovering more about him and the contemporaries architects and skilled craftsmen with whom he worked and shared interests.) As a result it was decided to produce a small booklet sharing some of this additional local history information. One of the issues in editing the book became what was important to include and what could be left out or included in the appendix. The authors appreciated the helpful guidance and support of Stirling City Heritage Trust in respect of producing both the leaflet and booklet and in the booklet editing process. Stirling City Heritage Trust were the main funders for this project. Additional funding was also provided by Stirling Council through a Communities grant. Stirling Local History Society also partly funded the project. The whole process in completion of the leaflet and the subsequent booklet took just over a year, partly due to new information becoming available and time spent sourcing and securing appropriate images and maps for inclusion in both the book and leaflet. For instance despite extensive searches we have so far only been able to find one photograph of John Allan, himself. We decided to research and write the earlier leaflet and later booklet, due to an interest among Society members in the unusual, innovative and varied range of buildings John Allan designed in Stirling and also curiosity to understand more about the symbolism and other features he increasingly used to decorate both the external and sometimes internal structures of both the commercial and residential buildings he designed in the local area.